In the beginning of the 21st century, primarily due to the auto industry, Metropolitan Detroit had already become one of the most religiously diverse cities in the country. But we had also become polarized as turmoil escalated in the world between and among the various faith traditions. In the belief that women could come together and form an interfaith movement where we could listen to each other, respect each other’s differences, and then take action towards change, Gail Katz, a Jew, Shahina Begg, a Muslim, and Trish Harris, a Catholic, reached out and brought other women together to form WISDOM (Women’s Interfaith Solutions for Dialogue and Outreach in MetroDetroit). In May, 2007, we officially became a 501(c)3 non-profit corporation with women from eight different religions on the Board of Directors. Today, there are 21 Board Members (including the Advisory Board), 50 Friends of WISDOM and over 300 people who subscribe to our newsletter; they join us on our quest to break down barriers among faith communities, races and cultural divides to build bridges of promise and create space for peace. In the years since our incorporation we have continued to present many programs. At one of our earliest events, at the Birmingham Temple, we realized the unity of WISDOM and the strength of the impact we could have in the community. When a group of Muslims went into the sanctuary of this Jewish house of worship to say their evening prayers to Allah, we knew that WISDOM would and will make a difference. 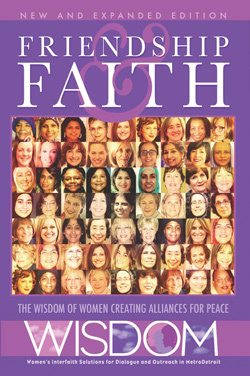 Today, there are 21 Board Members (including the Advisory Board), 50 Friends of WISDOM and over 800 people who subscribe to our newsletter, and they join us on our quest to break down barriers among faith communities, races and cultural divides to build bridges of promise and create space for peace.